This is a good sized sample! It’s an eye treatment designed to help reduce the look of lines, wrinkles, puffiness and dark circles. I found the lightweight cream to be gentle, soothing, and it absorbed quickly, too. The lipsticks are creamy, moisturizing, and the pigment is excellent. My favorite is the Smoked Almond shade in the middle. I’ve sampled this before thanks to Play by Sephora, and I love it! It’s a gel/cream hybrid formula that absorbs almost instantly, and leaves skin feeling incredibly smooth and soft! I even applied a bit over makeup when my skin was feeling dry, and it worked great. CHANEL in a beauty box? Yes, please! Sadly, I have to report that this tube was at least 50% air, so this is really a 1-2 time use sample. The formula is SO lightweight and absorbs almost instantly. If you are looking for a barely-there hand cream, this is a good one – and a pricey one! Each Macy’s Beauty Box includes a perfume sample as the sixth item. This is Tory’s first perfume with notes of Neroli, Grapefruit, Cassis, Bergamot, Peony, Tuberose, Jasmine Sambac, Vetiver, Sandalwood. Verdict: This box has a value of about $67.31 (not counting the makeup bag.) 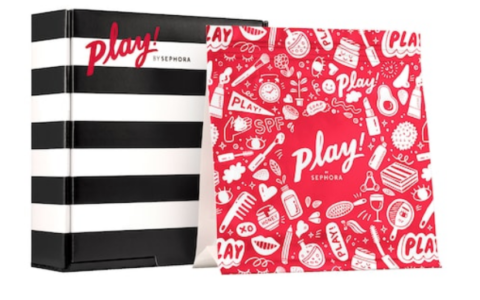 I think that’s a great value for a $15 beauty box, and the full-sized Nudestix, the Estee Lauder eye serum, and the Peter Thomas Roth Cream make this bag a winner for me. Can you still get this box if you sign up today? No. Currently, Macy’s is in waitlist mode. I think that the Nudestix is the smaller travel size and not the full size. This month is one of the best Macy’s has offered! Very happy! And you can totally get two uses out of each of the MAC lipstick samples, just seal it a small plastic baggie and use it within a couple days. I’m excited I’m off the wait list. I hope January is better. This was truly a disappointing month for this box. Another one like this will mean a cancellation for me. I’ll just have to live with fomo. You can walk into any Macy’s and ask for samples for free. You may not get the bag or the full size lip color, but all of this other stuff is available if you ask. Almost all of the large department stores will give you free samples of stuff even if you’re not buying at the moment, but Macy’s is the best overall. The Macys in my area is stingy with samples. You have to “know” someone if you want samples and then they give you a single foil packet of whatever or fragrance sprayed on a card. They always say we don’t have samples. Every Macy’s I’ve ever been to is ridiculously uptight and terrible about giving samples of any kind. Unless you buy something, then they may act they’re going out of their way to give you one foil packet or fragrance sample. You must have found the holy grail of Macy’s stores! That’s why their given samples, to give out to their customers. If their Manager or counter manger new this, they would not be happy. Sometimes the girls behind the counters like to keep the samples for themselves. And sometimes they are only given a limited amount and are told to give to their best customers. It’s always good to find one beauty adviser who will help you every time you go to Macy’s this way she can gather you the samples you want to try. Another thing, bring your own little sample containers and ask to fill with the sample your requesting if its in a cream or lotion form. But I can tell you they have tons of samples. We had a sample room full of samples. Samples sell product to me. So I’m all about sampling. I have actually never heard of Macy’s stores just giving out samples for free if you ask, ever. This isn’t the first time I am seeing it mentioned here on MSA, but honestly it was a surprise to me. I like the bag design but I’m so over sayings being on everything. In that gold script, too. It’s going to look so dated in a few years. Yes, ugh, tired of all the sayings on things. I don’t get these positive comments about macy’s “garbage” box lol. I subscribed for 2 months and every month since, when I see the review, I am thankful I canceled. I have a few of those lipstick samples I received as free bonus items from Sephora purchases. This box is NOT worth $10 even with the coupon. This month’s selection looks great to me! The non-resealable lipstick samples are kind of a pain – I much prefer something that I can seal. But other than that, good job, Macy’s. Got my bag today, but my only complaint is the Chanel hand lotion. I got two daps out of the tube and that was it. Big disappointment!! I really like mine this month. The bag is prettier in person than in the photos. Somehow I got an extra Estee Lauder Eye Concentrate, so I’m not complaining about that. The Nudestix is a better color than previous ones I’ve received. Can they send it to you? As long as I get items replaced I wouldn’t cancel. I’ve been happy with my bags so far. They’ve had some different brands in them. I received an email a few days ago that I was off the waiting list. I clicked through the email link and the site said that the product wasn’t available but I could sign up for the wait list. I sighed and tried to sign up for the wait list again and it said that I was already on it. I clicked around a few times and it signed me up! Agreed! Now who to find to tell so that they get the message? Agree, the reason i’m off the waitlist after a month but decided to not sign up for it. Yes, and some product gets stuck in the corners towards the top of the bottle and a q-tip won’t reach there. It’s enough for maybe 2 more applications so I haven’t thrown it out yet thinking I’ll think of a way to get it out…the serum is really nice though and this is their new one that came out a few months ago. Wanted the box. They are back on wait list status for anyone who wanted a nice sampler box of name brand items. That bag is gorgeous and I’m really impressed with the value of the first two items! That being said, the lipsticks on a card are a big “whomp whomp” to me and I hope Macy’s does not ever include product on a card as one of their five items again. There are five other items. Maybe the lip sample was the “bonus item”. It’s perfume that is always the extra in Macy’s bags.